Anyone else experiencing missing resources with the latest RW update? RW 8.1.7 is throwing this error when opening all my projects. This is only happening in 8.1.7. I’ve tested in previous versions and don’t have the issue. Note: all of my site files are saved remotely to dropbox vis the dropbox app on Mac. @manofdogz Do you have a link to your other post about this? I’ve just updated RapidWeaver, not having used it for some time. I got the message in the Topic Title. The window indicates 4 files, all of which say External, three of which say File is accessible, and three of which are on an Unknown Volume. If I Click the Scan Folder Button, I get directed to my project folder. But I have no idea how to find out what files are missing, or what to do about this issue. Having seen the missing resources issues in recent times, I delayed updating. Today took the plunge to 8.1.6 and pretty much all resources are missing in all my projects. And these are certainly not just old resources that are no longer needed. This is a shed load of work - why?? @dan Is this a known issue? 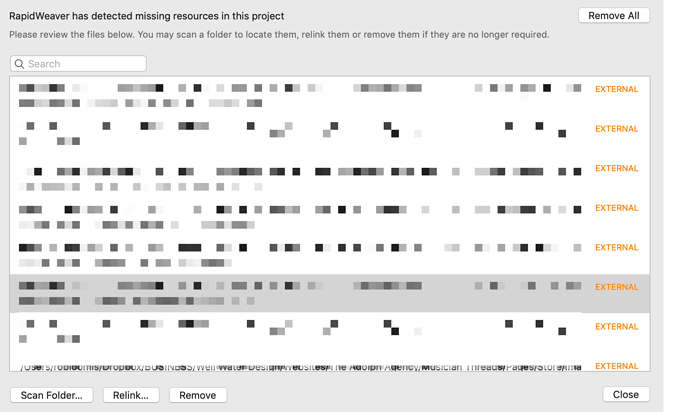 I am running 8.1.6 and 8.1.7 side by side and 8.1.7 introduces this issue where resources are no longer found. Ok, so I’ve been stupid and updated too. What a nightmare! All of my projects are claiming that resources are missing but I don’t understand what I’m supposed to do about it. For example, one of my projects complains that an .mp4 file is missing. However, it is quite happily sitting in the local location listed in the ‘missing resource’ popup and it is also available online. The only thing that is happening here from my side is that the resource isn’t actively being used at the moment. Is that why it’s flagging it up? Who knows? I opened another project of mine and it had TONS of these errors. I had to close it as I honestly can’t even bear to look at it. What is going on here? Why is it complaining about missing resources that are actually there? Bizarre. In short this is the issue: Apple have introduced sandboxing which in turn means older RapidWeaver projects can’t access the files you referenced in your project. Locating them again will give RapidWeaver access. When the dialog pops up, there’s some options at the bottom to relocate the files to grant RapidWeaver access. So long as you have your projects backed up, give it a go. It works great if you just give it a bit of time and don’t just dismiss the dialog. Once you’ve located your resources and saved the project, you won’t need to do this again. Thanks for following up on this @dan. I figured by relinking files, the issue would be resolved. My main question is why all of sudden this issue appeared. I began a project in 8.1.6 and by 8.1.7 all my resources are no longer linked to the project. I can open the project in 8.1.6, but not in 8.1.7 without the error message. As long as this isn’t a bug, then I’ll move forward and re-link all the resources. Hello- I just took the plunge and went for the sandboxed version. Unfortunately, there are a ton of external resources (as in 50+) which is strange because a lot of them appear to be images. So, this is a huge chore… I don’t even think I have these any longer. Can you save/download the images from your website if you no longer have them? This should only have to be done once, in my experience. I reverted back using my Time Machine at first, but recognized that at some point, it would probably have to be fixed by me. Hey Chuck- Thanks for the insights. I wound up doing part of what you talked about: Went into Time Machine and brought back the previous RW but still kept both versions since this is going to have to done at some point. Where I’m a little stuck is your idea of going into the existing web site to grab the resources. The problem is RW does not tell me what pages these resources are used in. I have no way to (that I can see) on how to manually do this. I’ll keep tinkering. Otherwise, there’s no real way other than hunt and peck. This is where I win by keeping things simple. I keep almost EVERYTHING Rapidweaver in one folder in my Home folder, my artwork, images, resources etc.and if/when I have a problem, I can not only restore the RW app from Time Machine but also my Rapid Weaver folder with the projects files and the art, images, resources and even the “tips” that I read here that I think might be useful in the future and save as PDF’s. If you had the “backup” field checked in your publish settings, can you find the resources in the folder you chose for desktop publishing? And that could be accessed through Time Machine also I think. There could also be a backup on your server but I have never had to access that one. As to where to place them, perhaps others have a simple way but I think I just reviewed all of them. Hindsights always so clear, right? This site and file dates back to ~2007 so there are over 10yrs or so of blog posts, theme changes, move from blocks to stacks, and the list of plugins that are no longer used goes on (and all the blog posts go even longer). Thus, even if I had kept copies, the problem is that some of these file names have been changed and so I wouldn’t even know what file RW was talking about. Was hoping for a simple way to understand what resources/resource location within the web site RW was talking about. Now, all this being said, I still have a deep love affair with RW: The people who make it, the developers who make it amazing, the community that helps support others, and the lightening fast web sites it creates. TOTALLY worth the work to figure this out and hope sandboxing brings more success to RMS!